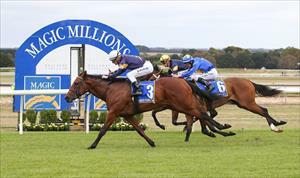 Runners at different courses on Saturday with Hawker Hurricane at Caulfield and Chicago Cub heading to Yarra Valley. Hawker Hurricane (pictured) runs in race five, the Blue Diamond Prelude (Gr 3) for colts and geldings over 1100m with Mark Zahra to ride. The son of Deep Field has not raced since winning on debut at Ballarat on November 24. “We’re really happy with him,” Moroney said. “He looks terrific and his work has been excellent. “If I have a query it is how firm the track will be on Saturday but there is rain forecast for Saturday morning and I’m hoping we get it as there was some give in the ground when he won at Ballarat. “He’s a big strong colt and his attitude is great. “Obviously it’s a strong race but his form looks good enough to me so he’s there to run well and I’ll be doing a rain dance in the morning! Chicago Cub is in the first race at Yarra Valley, the 3YO Maiden Plate over 1009m with Nikita Beriman to ride from barrier seven after scratchings. Gelded and stronger since his debut effort when third at Bendigo last April, the son of Zoustar has pleased his trainer this preparation. “We’re very happy with him and the form out of his first start has worked out particularly well,” Moroney said. “He’s done enough work to be competitive but he’ll improve for the run and there should be some give in the track.